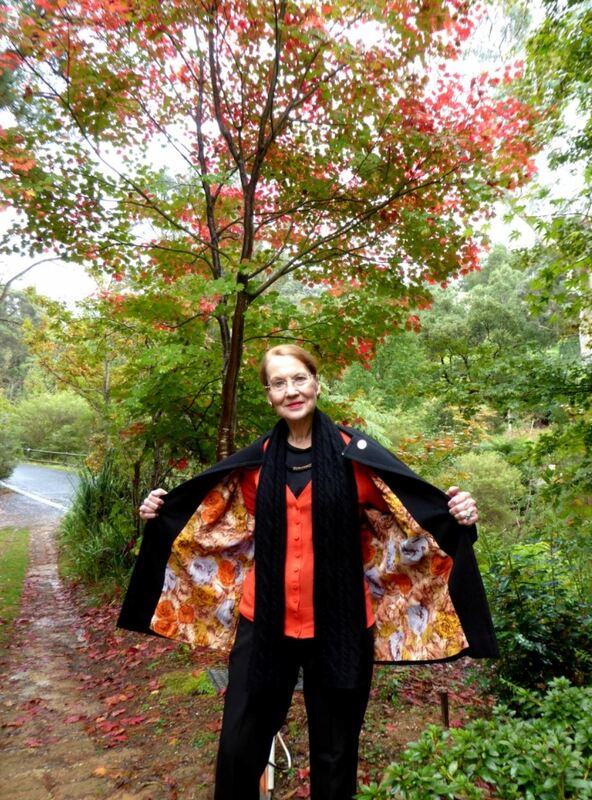 In my autumn inspired ‘coat of many colours’. 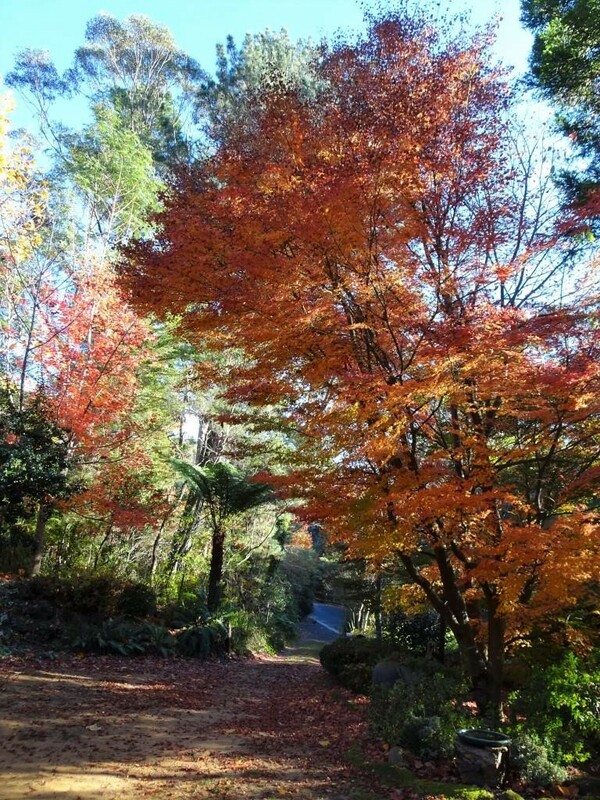 No matter what time of year, the walk up to my local Blue Mountains village of Blackheath is a delight. I always have my little point and shoot camera in my pocket. Without fail there is something worth snapping, and it’s an excuse to rest occasionally as I climb the hill. So off I go, down the drive past the letterbox. It’s a bit chilly, better put on a coat and scarf. Which direction shall I take today, left or right? Right I think. 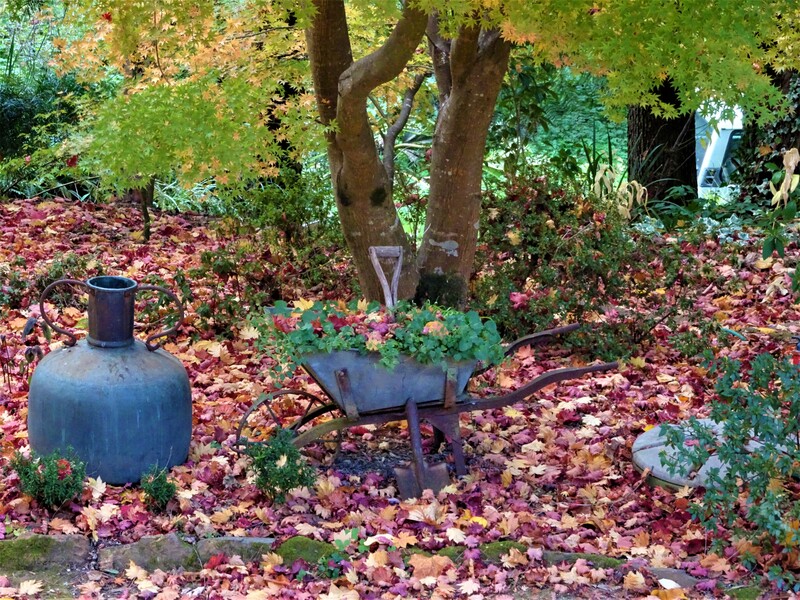 Leaves are decorating an old WWII wheelbarrow, made during construction of an air-raid shelter in Sydney. It was a gift from my ‘top side’ neighbour. 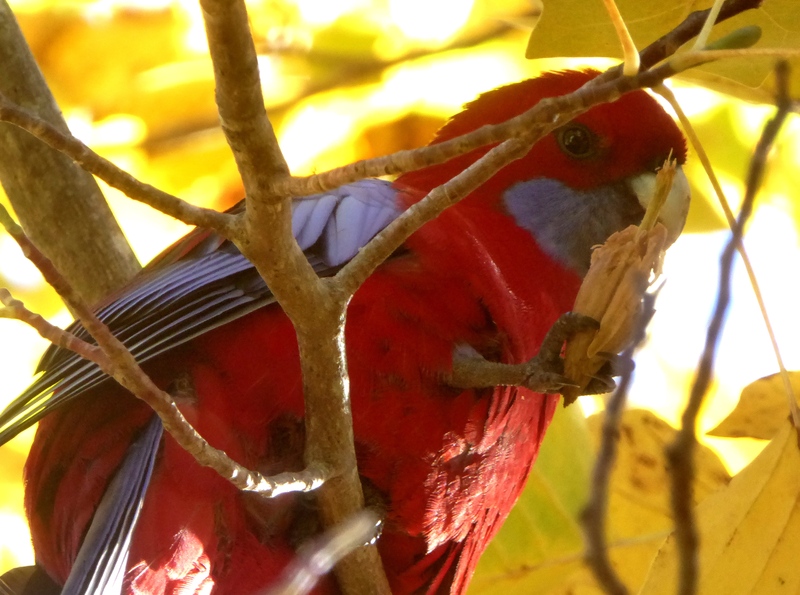 I only have to look up and there are birds feasting. 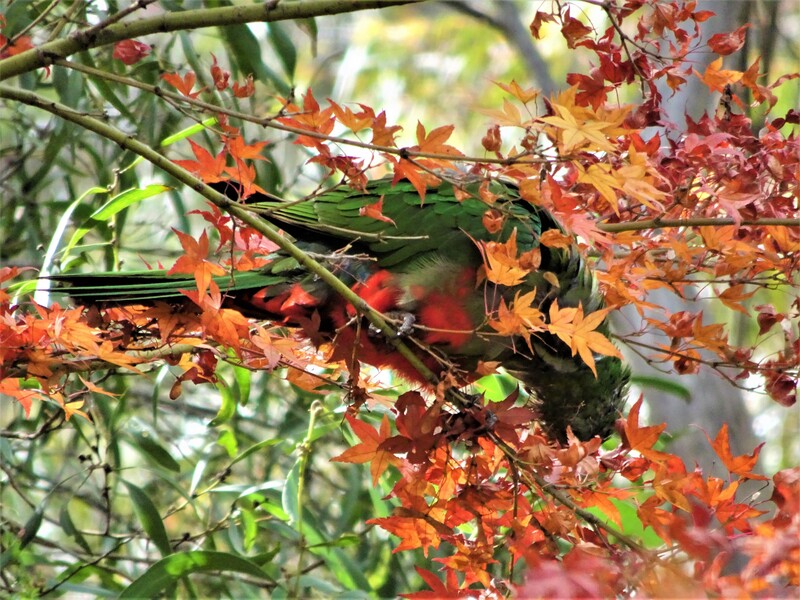 The king parrots love autumn nuts and maple seeds. 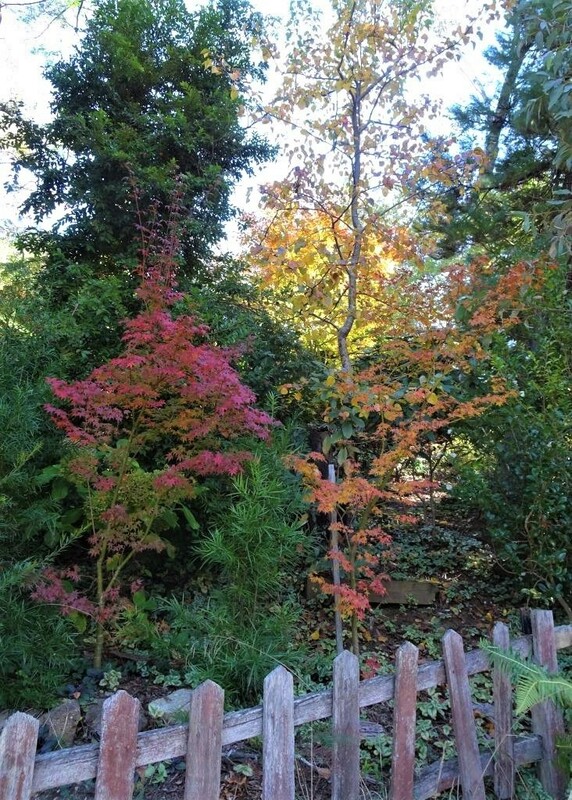 Seedling maples doing well. Old fence looking a bit wobbly though. 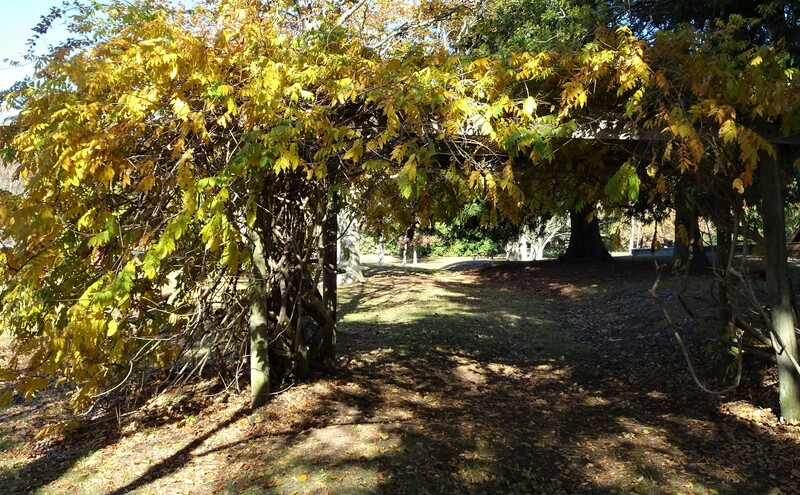 A few more steps and I’m in Memorial Park and passing the wisteria pergola, or it is pergoda? I emerge into the top end of Gardiner’s Crescent. 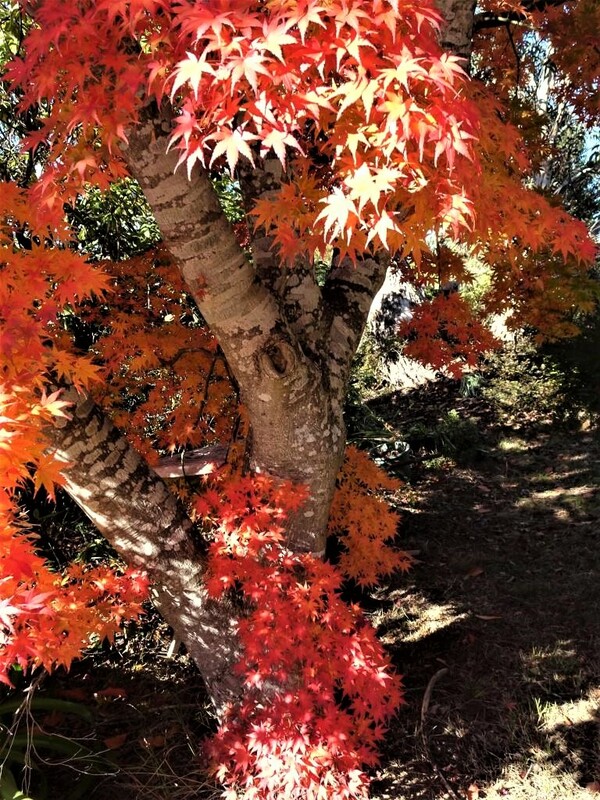 I’m not sure which is prettier on this Japanese maple, the trunk or the foliage. On the other side of the street is an avenue of ornamental cherry trees, Many of Blackheath’s cherry trees were planted by local residents. 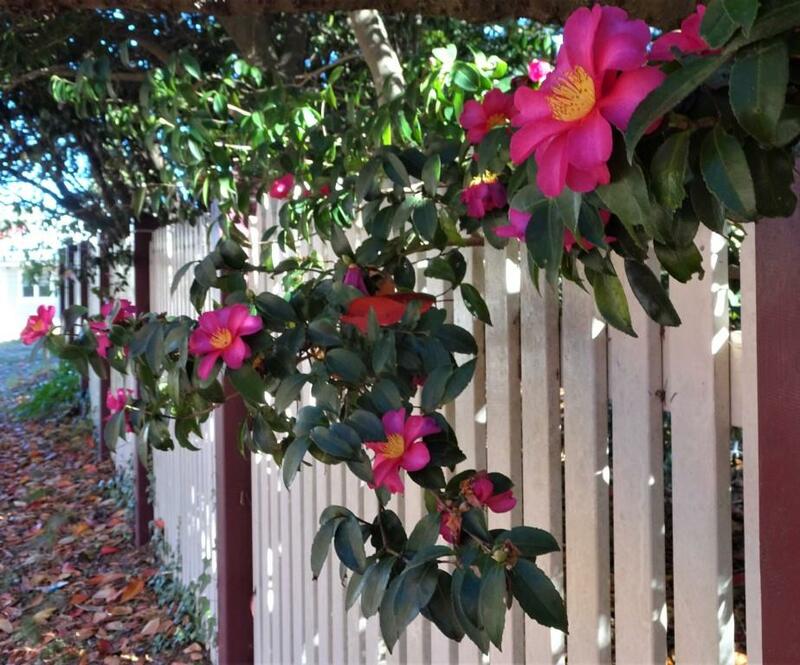 How pretty those autumn flowering camellias look against the white fence below the trees..
Now it’s into Govett’s Leap Road, and from here its just a short walk up to the shops. Still some original old cottages looking their best under colourful trees. Idyllic behind the picket fence. 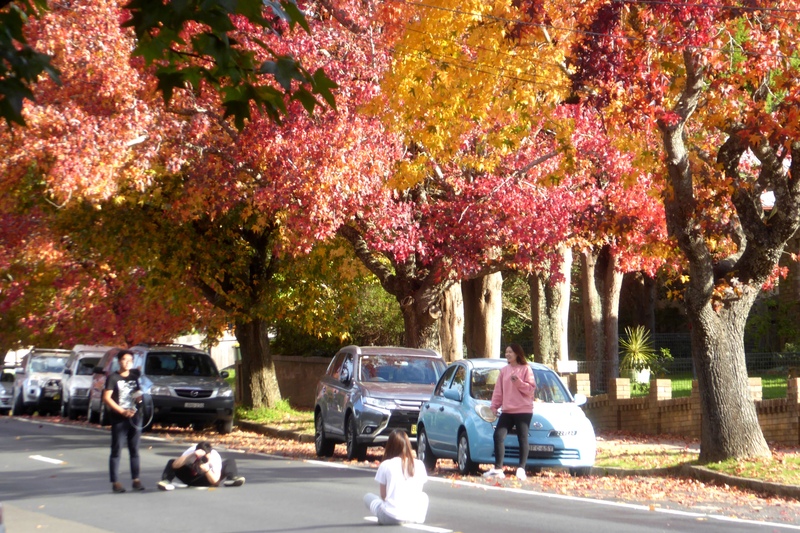 I cross Wentworth Street, where tourists are still snapping photos of the liquidambars. 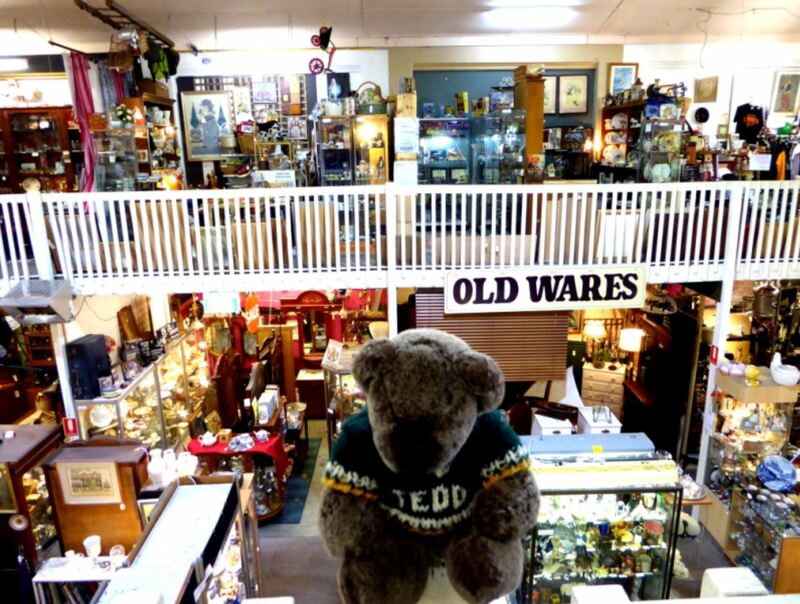 First stop for me in the village is often the Victory Antiques Centre (originally a picture theatre). I may be some time in here, looking for pill-boxes among other things. I enjoy a coffee at various cafes in my wanderings, but I do have a soft spot for Altitude, because they sell wonderful Melting Moments. They remind me of my mother. Sorry, messed up the coffee art before I took this pic. I’ll leave my walk home for another post, but I complete a circle; down past the Community Centre, across Wentworth Street, past the start of Inconstant Street (funny name eh?) then down the hill back to The Gums. 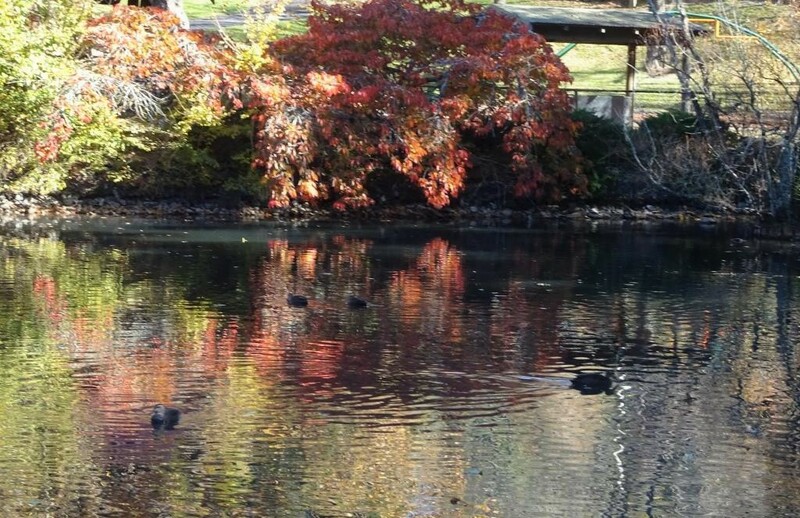 NOTE – There was a strong wind today, which removed most of the autumn leaves. Winter is nigh. Such a pretty part of the world that you live in. Thanks for sharing with us! Yes, it is a beautiful place, Christine. How lovely it was to go on the Autumn walk with you. Each decorative milestone on the way enlarged your expressive text with a photo. I was there with you; and now, I rest awhile until you post the remainder of the loop towards ‘The Gums’. I particularly liked the way you increased the Autumnal atmosphere by wearing your superb lined cloak, or is it a coat? 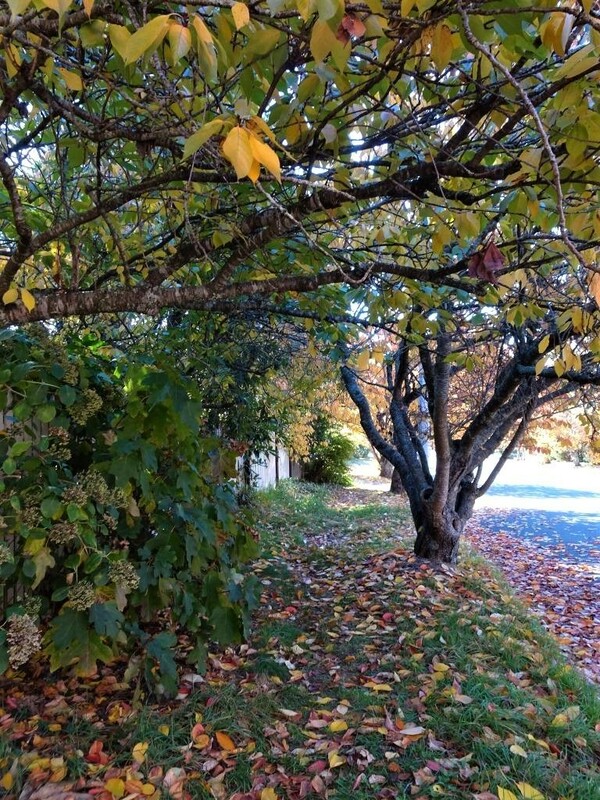 As the walk extended, I could almost feel the breeze collecting the leaves and tossing reds, browns and yellow shapes into the air around your feet. The coffee stop came at just he right time so that we could rest for a while before continuing on our way. I liken it to sipping a small citrus palette teaser between dining courses so that each taste experience can be indulged to the max.. Thanks for your lovely words, Heather. Yes, I was wearing a coat made by my late mother-in-law. I do love little Blackheath. What a delightful walk you’ve shared with us. 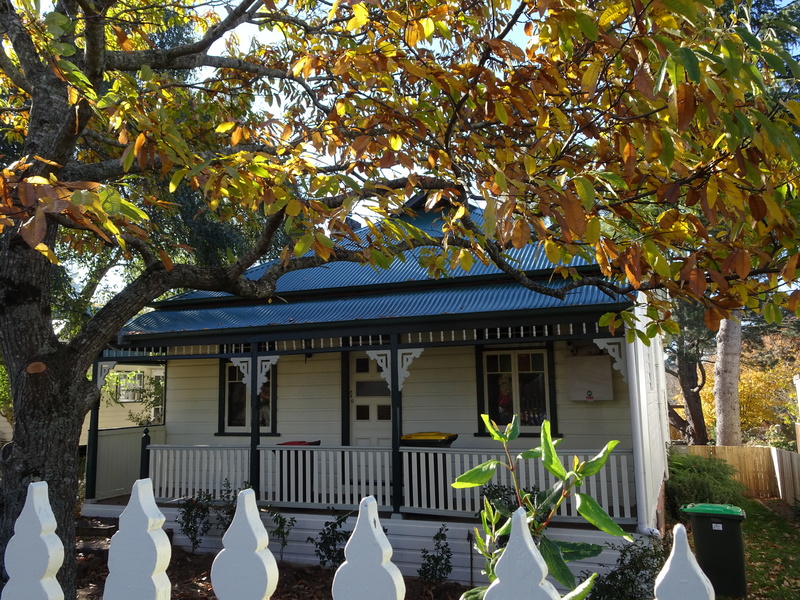 I loved the old cottage which was similar to my brother and family’s home in Fremantle. Thanks so much for taking the trouble to leave message.